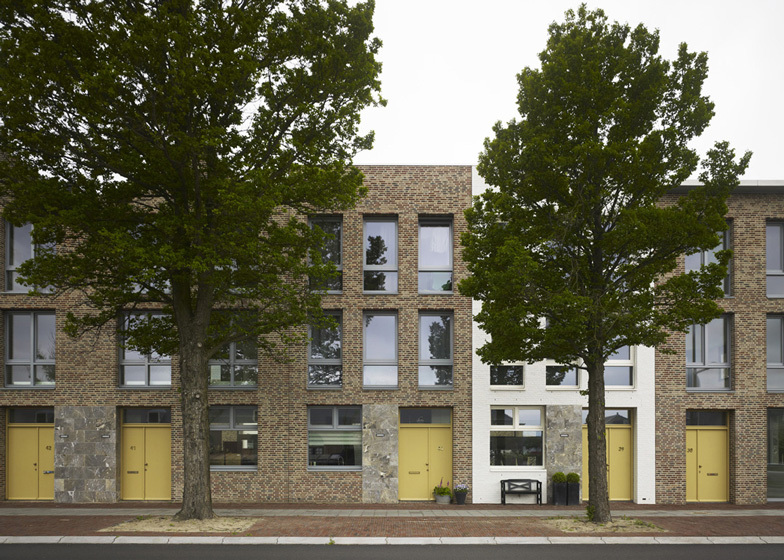 London firm Tony Fretton has sandwiched two rows of brick houses between a pair of canals in the town of Den Helder in the Netherlands (+ slideshow). 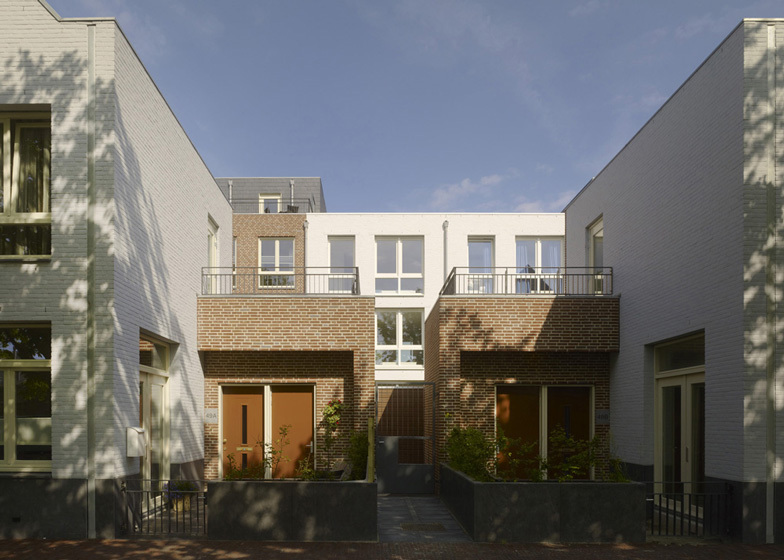 Tony Fretton Architects collaborated with Dutch firm Geurst en Schulze Architecten to design 16 houses for the Molenplein site, as part of a wider masterplan by West 8 that centres around the redevelopment of the town's former navy base. Three-storey houses stretch along the front of the site, facing out across the dockyard, while a row of smaller two-storey residences run along behind and are separated by private gardens. 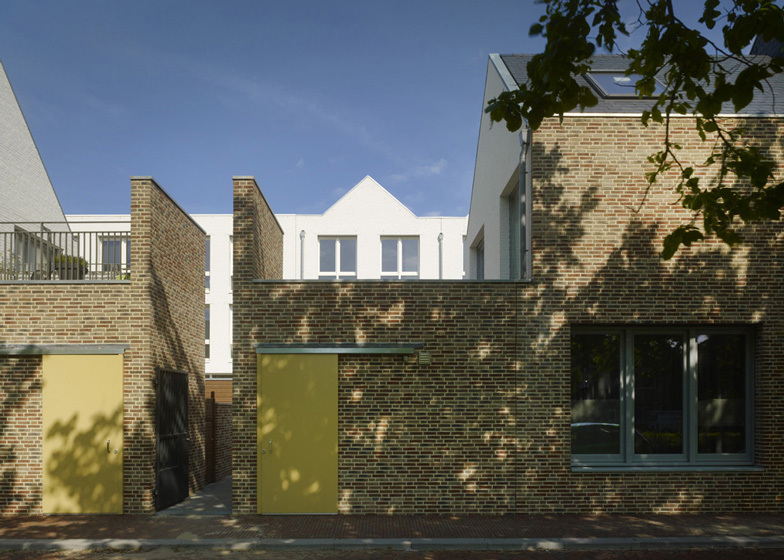 Drawing inspiration from canal houses of the early twentieth century, the houses feature a mixture of linear and gabled profiles, and present both exposed and painted brickwork facades. Bright yellow doors and ornamental marble panels mark the entrances to each house, plus the windows come with chunky wooden frames. Each of the 16 houses has one of four standard layouts. There are few internal partitions and finishes, as the architects wanted to give residents the opportunity to design their own interiors. Molenplein occupies a long site between two canals, the Helderskanaal and Werfkanaal, where it looks out onto Den Helder's former Napoleonic naval yard. The development is part of a regeneration strategy by the municipality to attract middle-income people to the area following the relocation of the Dutch navy base. The Napoleonic dockyard has also been redeveloped, providing places for business and culture. West 8's masterplan for Molenplein preserves the character, scale and diversity of the city fabric along each canal; the plan comprises large three-storey houses facing the dockyard and compact two-storey houses to the rear, with private gardens in between, and intersperses designs by Tony Fretton Architects with those of Geurst en Schulze Architecten. Inspired by the openness and energy that the practice observed in an earlier development they designed - De Prinsendam in Overhoeks, Amsterdam - where owners radically personalised their interiors, the houses are presented with unplanned interiors and carefully positioned service risers, fenestration and staircases that support a wide range of possible internal configurations.